It's no secret that I love the fall for so many obvious reasons which I've mentioned innumerable times on here. As we're approaching spring so rapidly (although it's been very cold here in NY and expecting some slushy snow fall the next couple of days) I get a little nostalgic thinking of all the comfort foods and the great aromatics of the fall and that sent me on a sage-filled recipe binge this week, which means there's another very simple sage recipe coming next. The earthy aroma of sage that's released while mincing it makes me smile from ear-to-ear every time! I'm sure that might not be the case for some of you, but if you enjoy sage as I do, you'll find this old recipe I've had for these amazing melt-in-your-mouth apricot-sage cookies delectable. They're basically a version of shortbread cookies with a couple of tablespoons of snipped fresh sage added to it. Then once baked you create a jam-filled little cookie sandwich which are perfect for afternoon tea and/or tea party. You know how too much sage can give that bitter taste? Well, let me tell you not in these. The sage flavor actually is very faint in this recipe - the melding of flavor of the savory herbs and sweetness from the apricot is just the right element of surprise when you bite into them. They are a classic and super yummy. Preheat oven to 375 F. In a bowl mix together flour, sugar, and cornmeal. Using a pastry blender, cut in butter until mixture resembles fine crumbs. Stir in sage. Add milk. Stir with a fork to combine; form into a ball. Knead until smooth; divide in half. On lightly floured surface, roll half the dough at a time to 1/4-inch thickness. 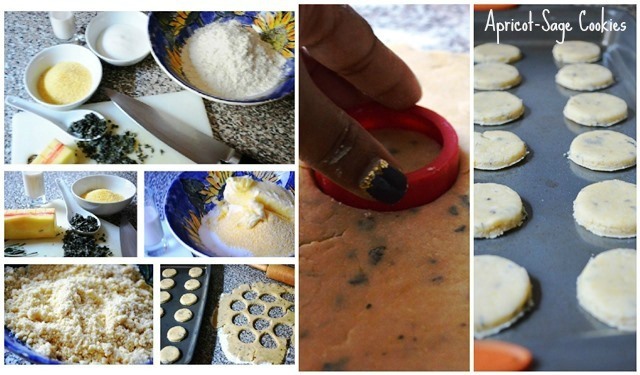 Using 2-inch round cookie cutter, cut dough. Place cutouts 1 inch apart onto ungreased cookie sheet. Bake about 10 minutes or until the edges are firm and lightly brown. Transfer cookies onto a wire rack to cool down. After cooling thoroughly, spread bottom half the cookies with the apricot jam. Top remaining cookies. Makes about 20 - 30 depending on your cookie cutter size. TIP: If you want a much larger batch - say for a soiree, instead of making sandwich cookies, you could just put a thumbprint in each cookie and then fill the thumbprint indention with a jam of your liking afterwards as well. I think that would be quite adorable. Enjoy!